Nathan Fillion, Neil Patrick Harris, and directed by Joss Whedon. What could be better? Dr. Horrible's Sing Along Blog. 1. Mega Extra Testosterone in high school = balding and fat ten years later, proven at least 5 times during the reunion. Hey, I may not be so hot myself, but no one's saying "YESSSSSS!!" when they see me that way. 2. Movie Reviews: The Diving Bell and the Butterfly = Ah-Maze-Ing (see, I like non-action too). Upcoming movie Death Race = I guess I lied about being a Jason Statham fan for the rest of my life. Why would you do that, Jason? Money problems? I'd loan you 5 bucks. Because that is all you're going to make on that movie. I Want To Believe = 3 stars. You are SO not allowed to pull "Scully and Mulder have been together for years now" and get away with it. Punks. 3. Landing gear = Really important to the whole landing the plane thing. Thank goodness for second approaches. After enduring a toddler (not my own) crying for over an hour, I was finally falling asleep. His cyclical high pitched screams had died down and I was at that state where everything one thinks makes perfect sense to oneself. You know what I'm talking about. That part when you start thinking that if you put your shoes on backwards and eat gingersnap cookies that the crumbs might fly out the window and fall into a perfectly good tart pan for dessert with the wiggly leggy guys from the muppets, and, "Uh huh, I'm not asleep. I'm listening to you." I'm breathing heavy and I feel something moving against my feet. Not thinking too much, I push it back. But it won't go back. It's being pushed up further. The woman behind me had put her pillow under my seat, and then started kicking as far as it would go, until it was in my area. Now, I think that this violates some major cardinal rules here, specifically Flying Commandment #8 which states: Thou Shalt Not Enter Other Passengers' Space With Anything Other Than the Back of Your Chair During Recline. 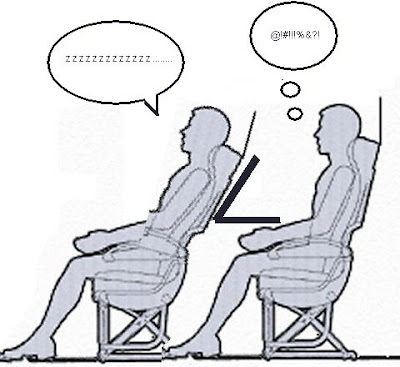 This rule refers to putting your hands on the back of the chair to pull yourself up (unless you are less mobile, in which case you are forgiven), hanging your wrist over the armrest, keeping your knees off the back of the seat, and placing your feet in your 10 inch square area at all times. Then the woman began to violate Flying Commandment #3: Talking Shall Be Kept to a Minimum to Establish Friendliness, But Avoid Life Long Friendships From Taking Place While at 30,000 Feet. I've never been a talker on the airplane. I put the grim face on and hope that no one thinks I look approachable. I really don't understand having conversations on the airplane that last from 11 pm until 7 am. This woman proceeded to violate Commandment #8 twice more: hanging on the back of my seat (while catching my hair in her obviously unfeeling hands), and kicking the back of my seat the second before I had drifted into sleep again, after deciphering the meaning for pen caps on permanent markers that have the little clip broken off, providing small animals a stick for digging. In all truthfulness, she could have kicked my seat on purpose. Commandment # 11 states: "Thou Mayst Kick the Seat if a Dirty Look Doth Not Suffice." I can just picture her thinking, "Geez, that girl totally snores so loud." 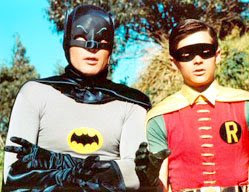 Duh-duh duh-duh duh-duh duh-duh, BAT-MAN! I have a major weakness. This is not something that I can blame on nostalgia or upbringing although I wish I could. You might totally disrespect me after you read this post. My weakness is called: action films. I really appreciate good films, independent films, foreign films, even the occasional musical (although I normally show them great disdain on principle, except old ones that have cute, perfect people who dance in heels next to short guys in tail coats). But oh! Put in an action movie and I'm totally hooked. No matter how stupid they are, really. This weakness has only grown in the past few years. I never really watched action movies before college, other than Speed (about 50 billion times-- I once chatted with people from an online group who claimed to love the movie more than life itself and constantly repeated its lines). I also really loved The Fugitive, although some would argue that it is not a strict action film. I would totally watch an action film before a chick flick. I wish action films had a silly name like that, and the only thing I can think of that also rhymes with flick should not be a publicly spoken name. When I get on netflix or go to the video rental store I always end up looking through the action section the longest. Jake, on the other hand, pretty much hates action movies. I think this is why I should be designated the pants wearer in the family. He can wear the shorts, but I wear pants, because I like The Transporter (and #2) and will be a sworn Jason Statham fan until I die. That's what pants-wearing is all about. So, on opening night, I succumbed to the absolute craze of Batman. I kind of feel bad about contributing to American materialism in the biggest opening night that ever happened, but I had to do it. I loved the first one and I had nothing but high expectations for this movie. And I must say, I was not disappointed. I did not want it to end. In its defense, Christopher Nolan has created a great movie, not just an action film. Lots of good discussion about vigilantism. The Heath Ledger performance goes without saying. The film also tipped me off to another weakness of mine. For some reason, I do really like Guys Who Get The Job Done (I think some people might call these guys "Bad---". I consider myself a liberal in 9 out of 10 issues, yet I find myself drawn to self-sacrificing hot shots who get those bad guys no matter what. YEAH. It's always at this point that I start wondering if Freud was right, at least about me. This is probably why I loved Alias and have fantasies about joining the CIA and being a bad--- myself. Then I have to shake it off and watch Grey's Anatomy. Deb, my favorite foodie blogger, recently asked people to label their cooking fears. I was surprised by the extraordinary variety (she had over 200 comments the last time I checked) and thought, at least on my small scale, it might be interesting to address people's frights in regards to cooking. I answered the post myself because the question immediately brought to mind pork. Now, pork in the slow cooker or dutch oven is one thing, with its marbles and chunks of fat that melt into the meat to create a perfectly gorgeous texture; lean pork that requires a quick, hot pan before it sends its juices to the ceiling and toughens up to make chewing leather is quite another. I am terrified of pork chops and pork loin. There is also the matter of a certain episode of House M.D. that I've watched, involving a girl with a parasite from pork living in her brain and causing bleeding and certain death. This only feeds my paranoia. Israel is a pork on the barbecue expert, and I think I might be able to do that, yet usually I cook indoors. Coals are not my thing, but that is for another post. Italian icing is the other thing I have never been able to get right. If you're not familiar with the process, it involves hot sugar syrup set to exactly the right temperature, and moves on to a slow stream incorporated by whisking into egg whites. The pictures of it are lovely. Not lovely enough for me to attempt it, again. So tell me, readers, what is your cooking fear? Maybe some of us know how to help. Laboring Fruit -or- "I Am Emily"
Jake says to me, "We have way too many treats around the house. Why do you want to make a pie?" "Because this pie is so gooooood! We have to make it." Later I pretend that I want to go hiking just to go hiking. But really I want to make a pie. So when he asks me which Hauula loop I want to go on, I pick the one with mountain apples, even though I know he'll have to duck under lots of branches with Amaya on his back, and will probably complain about it the whole time. "There probably aren't any mountain apples you know. Mike went there a few weeks ago and they were still green." "Whatever." I silently pray that there will be ripe mountain apples, or at least enough for Jake to scavenge for them. I borrowed a book from the library for Amaya last week called "Yummers" by James Marshall. I remembered reading it as a kid and thought, "Oh, this is a great book." I read it again and realized why I liked it so much as a kid. The pig, Emily, knows that she is too fat and out of shape, so decides to start exercising. She hates it, of course, so the turtle, Eugene, suggests that they go out walking, because it's exercise, good for you, and doesn't seem like exercise. On their walk they get hungry, and Eugene suggests that they stop at his favorite sandwich vending machine. Emily can't decide what to get so she gets two sandwiches. They proceed to see many more yummy foods along the way, stopping at a restaurant, tasting booth, roadside stall, ice cream shoppe, etc. You get the idea. Eugene wisely stops himself from eating more food by the time they get to the second place, but Emily's call is "Yummers!" She gets sick to her stomach and has to stay in bed, where Eugene advises plenty of rest and food, much to Emily's happiness. I guess James Marshall has met me somewhere. On that note, here's my mountain apple pie. This crust recipe is basically the most perfect one there is, and if you don't agree I will never trust your food taste again. I wasn't formerly obsessive about crust, but now I will be. The texture is perfectly buttery and shatters in your mouth without all of that sinking around that butter crusts do. I compared the recipe to The Joy of Cooking and the basic difference? More sugar, more butter, chill before baking. Thank you, Baking Illustrated, and your millions of hours of test kitchen work. Enough Mountain apples to fill the pie, sliced thinly. 1. Adjust oven rack to the lowest position, place a rimmed baking sheet on it, and heat the oven to 500 degrees. 2. Roll out one disk of dough and put in pie plate. 3. Toss apple with lemon and zest. Whisk flour, sugar, spices, and salt together in a bowl. Toss dry ingredients with the apples. Turn the whole thing into a pie shell, mounding in the middle. 5. Make four slits on the top of the pie. Brush the top crust with beaten egg white, and sprinkle with sugar. Put the pie in the oven (on the baking sheet), reducing the heat to 425 and cook for 25 minutes (until top crust is slightly golden). Then reduce heat to 375 and bake for 30-35 minutes longer, until the crust is deep golden brown. Transfer the pie to a wire rack and let cool. Sure, it's a great idea, if you can actually get there before they close at 3:30 pm. When I'm in school, that never happens. And if the guy in front of you doesn't have $3000 worth of 15 different money orders. And if you knew what international forms you were supposed to fill out so that you don't wait in line for the guy in front of you with his money orders, and then when you finally get up there you have to go back because you filled out the wrong one. And if they didn't close five minutes early so you feel like you have to come back tomorrow because it will take forever to fill out this form. Japanese translation of "Don't feed the birds because then they poop everywhere." In the children's foreign book section at Book Off. I guess there is no "Adults Only" section, even if they had known what it was. I was lucky enough to help a friend cook dinner last night, and eat it too. Lorna Hershinow is the founder of Celebrate Reading, a reading festival for everyone (including my students) that features local, national, and international authors all on one day in April. I've been helping her in my mostly uncommitted style, which means I've done almost nothing but been given a lot of credit. Don't you love those kind of partners? Well, Lorna has plenty of ardor, and is very literary, committed, and involved. I stress this because she is always on the up and up in the goings on about town while I, well, am not. Lorna is always good enough to let me know what's happening and encourages me to come. Most of the time I have to beg out due to my inability to juggle much. Yesterday she invited me to a reading by Kathy Phillips, who wrote about taking care of her aging father and would have been fabulous to hear, but I didn't attend, knowing that it would be Amaya's nap time (besides the fact that she would have been unruly through such a reading). I did accept the invitation for a dinner at her house afterwards, to which I brought some sushi and mountain apple pie (more to come on that front later). Lorna has mislabeled me as some sort of expert on food because I admitted that Gourmet was about the only thing I read these days, put me in charge, and deferred to me in cooking decisions. I felt like a complete fraud. The recipe came from her son, David. Apparently he and his wife are foodies themselves and I'm not sure if they made up the recipe or got it from somewhere else, still I had to credit them because it is such a good one. I love soba noodles, especially with peanut butter. How could you go wrong? Did I mention how EASY this recipe is? I helped make it, but I didn't write down the exact recipe. I made it again today and tried to go from memory, so it may be a little off. And sorry about the picture being so ugly. Blurg. Cook soba noodles as directed (boiling water, pay attention to it because it cooks quickly and it's not as good overcooked). Drain and toss with some sesame oil in a large bowl. In the meantime, saute sprouts and snowpeas in a little oil and garlic. You can use any vegetables, really. I also put in broccoli and zuchinni (matchsticks). Put into large bowl with soba. Saute green onions and garlic in some oil, adding ginger when the onions are nearly cooked. Then add soy sauce, peanut butter, and honey. At this point I added more of the honey (maybe 2 T) and made it to taste. Then add chili garlic sauce and keep whisking or stirring until it thickens. Add shredded carrots and sauce to bowl, toss together and serve. You can also add shrimp or chicken, but it's good vegetarian food too. Her eyes are still green in the right light. She can always be the "one more" on the hammock. She likes everyone, and thinks about them often. sometimes she will spontaneously start listing all the people that she likes: "Mickey, Minami, Adam,Truman, Pammy, Uncle Mikey, Nana, Gigi, Grandma, Hea, Pono..."
If her ice cream cone is melting, she doesn't mind if you help her with it. She never cares how clean the bathroom is. She thinks that doing chores and play time can be the same thing. If she is having a good day, you are having a good day. Her favorite clothes are the ones you choose for her. If she forgets what she's trying to tell you while forming the words, it's okay to pick up on the next thing that comes into her mind. "whoihbleyahne caaaaaaape." "What?" "Mmmmm, Cake? OH! Mama, I want cake." Sometimes she'll let you blog while she plays with play-do. She always wants to be with you. Japanese pride themselves on being nerds about cooking. They also really love their own food. In some countries it's about the availability of ingredients and exposure or lack of to other ethnic cooking. With Japanese it's plain ol' obsession with the best of their own food. I mean, where else can you find dozens of shops on the same street selling 30 different kinds of specialty tsukemono (pickles)? During the summer cold noodles are favored as the food of choice. I ate cold udon at a hospital cafeteria (yes, the food is good there) the second day we were in Japan. I once saw a special on soba on tv where they served it by running it through bamboo half pipes of cold water right after cooking it and it flowed down to the customers who picked it up out of the pipes as it came by. There are innumerable ramen shops. My favorites are the ones where you stand at the counter and slurp your noodles, all of which can be ordered from the pictures on the walls. The list of types of Japanese food is long, but when every place is a specialty in one of these areas, you know that Japanese love their food. Tempura, curry, tonkatsu (yes, restaurants serve just breaded and fried pork, special cuts stuffed with interesting flavor combinations--I once had shiso and plum), okonomiyaki, takoyaki (I like it best when they leave out the tako), noodles (cold and hot), kamemeshi, oden, ishiyaki, sushi, yakiniku, shabu shabu, sukiyaki, donburi, yakitori... and more. Okonomiyaki was the best dining experience we had. We sat at a table with a big cast iron griddle top (scary with kids) and they brought out our order as batter with a whole bunch of toppings. You mixed the bowl up and cooked it at the table. The people next to us were more advanced and had ordered other stir fry stuff. We were totally ignorant and thought that the waiter was going to cook it for us so we just sat there. We ordered three-- leek and beef, cheese and mochi, and a kimchi one. Seriously grubbin' (as Amy likes to say). I forgot to take a picture, so I only got one of the leftovers. As you can see, not much. The funny thing about Japanese, however, is the dessert. Japanese fall way out of line with the whole traditional food thing once you hit dessert. Yes, there is mochi and lots of red bean stuffed confection, but it starts with Taiyaki being stuffed with custard (the picture is the chocolate taiyaki stuffed with custard we made with my new Taiyaki pan) moves to crepes, shaved ice parfaits, french pastries, and ends with cake. LOTS OF CAKE. I actually didn't eat any cake while I was in Japan, except for the one that was in Jesse and Bekah's freezer, which was from costco. My mom was totally shocked that I did not eat from Even. One. Japanese. Cake. Shop. I was pretty sad about it too. I will have to console myself with the Japanese cake place at Ala Moana. Japanese cake is totally completely different from American cake. Just trust me. It also is way prettier. They set up their glass cases as if you were buying diamonds. Just a little less expensive. The picture of the cakes here is just the outside display. Plus they're plastic. If you go in it's all sliced, and real. They're very creative with cake and really like fresh cream and fruit. Very smart, I think. I also mentioned pastry. We went to a Joel Robuchon bakery (which has a Joel Robuchon restaurant next door at $200 per person for dinner) that really just blew everything else out of the water. This pictured croissant had dehydrated strawberries on top, and was stuffed with strawberry and chocolate. Pretty much the most delightful thing I've ever tasted. Except for the mushroom and cheese topped pastry that tasted like it had been fried on the bottom. Oh, Joel made that too. Japanese are pretty much obsessive about their French pastry. Unlike the states, where the bakery runs out partway through the day and by the end of the day are selling their leftovers for half off because they've gotten cold and chewy, Japanese pastry chefs are baking all day long and bringing out fresh batches every hour. Plus the variety is crazy. Fried curry pan, katsu sandwiches, hot dog pastries, gooey sweet rolls, milk rolls, custard and caramel topped pastries--- When you go, you really do need a serving tray, because it's impossible to stop yourself. Most bakeries have specialty pastries that you can only get exclusively in that shop, even if it's a chain. I also never got to eat a crepe this time. I'm regretting that. They are stuffed with soft cream and chocolate, or pretty much whatever you can imagine. What I did get, thank goodness, was soft cream (soft serve, to you). Japanese have it figured out. I have no idea why this is not widely available in the U.S. other than as vanilla at McDonald's. In Japan you can get it from the convienence store, a restaurant, or a booth in the shopping streets. The flavors are awesome too. At this place I got a caramel (for me and Amaya), and a banana (for me). It took me a while to choose just two. When I'm rich and famous I'm buying a soft cream machine, as well as a advertisement-sized large plastic soft cream with cone to announce that I have soft cream at my house. Just to rub it in. I've been thinking lately that I'd rather be thought of as left over, instead of left behind. Leftovers are more like, in excess of, too much to finish but too good to throw away. You may think that leftovers has a negative connotation, but at least it implies some choice in keeping them around, as opposed to left behind, which sounds more incidental in the wake of bigger and better choices. Since everyone is gone, I'm eating more leftovers. But if you have to have leftovers, wouldn't you want it to be this? Pork shoulder steaks in the slow cooker with a marinade of spices that I adapted from this month's Gourmet (originally intended for goat meat), mango salsa, home made pinto beans, roasted poblanos, and fresh mozarella cheese over corn tortillas. I ate them for two meals already, and I think there are about two more left. The question is, am I the leftover that sits in the fridge and ignored, or the one that you get sick of having and vow never to make again? 1. Giveaways. Since when did all my friend bloggers start having enough readers and contacts to have successful giveaways? Who do they think they are?! And WHY do I never win? 3. Robbie and Scott are doing Body for Life. 6 snacks (they call them meals), exercise every day, and only one free day of treats. Seriously. Plus, if there aren't people coming over for fattening treats, then I have no excuse to make them. 4. School starts in two and a half weeks. 5. I finally get worked up enough to really work out hard every day, and I twist my ankle (my ankle actually touched the ground on both sides). So instead, I have to do sit ups and push ups with Tony Horton. BLECH.